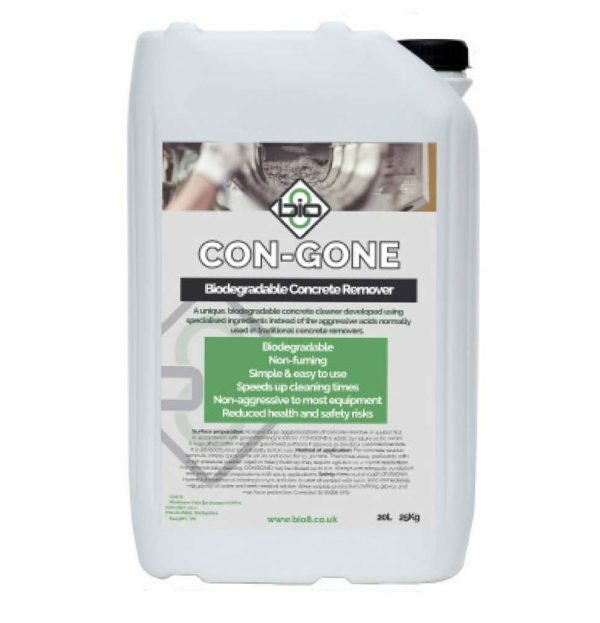 Con Gone is a revolutionary biodegradable, non-fuming, cement remover for industrial application. Unlike traditional concrete removers, Con-Gone doesn’t use hydrochloric acids which is becoming less acceptable to take on site due its ability to contaminate land as well as being a danger to staff. Hardened concrete deposits – Tools, mixers, chutes, moulds, spatter, vehicle/mobile equipment cleaning. Fresh uncured concrete – Tools, mixers, chutes, machinery, moulds, vehicle/mobile equipment cleaning, spatter/spills. 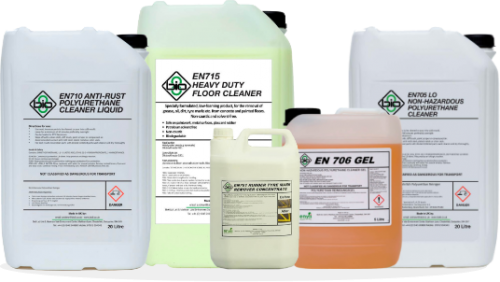 Traditionally, cement remover liquid products have had to be acidic in order to be effective. However, not all acids react in the same way. Hydrochloric acid is very aggressive and gives off hydrochloric fumes, particularly at higher concentrations; whereas less powerful acids such as Glycolic acid are not as effective and work slower. Different companies will describe them as anything – from sugar-based Glycolic acid to Muriatic acid (which is just another name for Hydrochloric acid) to try and disguise the fact that they are harmful. The perfect product is one that strikes an even balance between speed of reaction and being far less aggressive and harmful by nature. This was the basis for Con-Gone; a safe, biodegradable concrete remover that is still highly effective. Con-Gone does not use acid in the conventional sense, but instead uses a biodegradable acidic salt based on Urea. This biodegradable salt is not considered corrosive to skin and is only classified as corrosive to metal in it’s original state. Con-Gone however contains an inhibitor in the formulation which restricts its reaction with metals. Will this work on hardened and wet concrete? 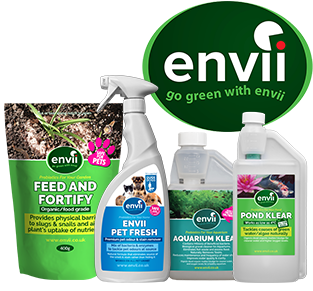 Can this be used on building sites without risk of contamination of land? Is this aggressive to equipment?